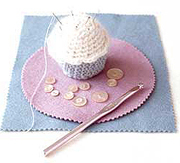 The first time I saw this Cupcake Pin Cushion in print was in a Good Housekeeping magazine. Then I saw it again online at the Cupcake Queen’s site. I don’t knit, crochet, or sew either, but I think this would be a FUN way to store safety pins and needles. If you’re good at it, you may find that it’s a novel way to make some spare money. Here’s proof that it may take a few tries to look perfect!